Are you looking for a cheap and easy Dartmouth Park, NW5 house clearance service to deal with the clutter in your home? Then hire Go Rubbish Go! We are your one-stop shop for house clearance services in NW5. We offer our top-notch services at really low prices. We want you to be happy with our work not feeling robbed after we leave your house. We can remove the clutter in your house in no time at all. All you have to do is contact us on 020 8610 9182 and share your house clearance requirements with one of our team! We will provide you with a free quotation with no obligation necessary! Book now and benefit from our affordable NW5 house clearance prices! We pride ourselves on our flexibility when it comes to prices. As soon as you call us you will be offered a tailor-made solution to your house clearance woes in Dartmouth Park. The price we will offer you will be based on your job description. We will try our best to accommodate all your clearance needs and meet your budget. Compare the prices and you will see that no one else in NW5 can offer you lower prices than us! Call us now and you will get a heavy discount! Over the last ten years we have helped thousands of people in London clear out their homes. We have years of experience in the Dartmouth Park house clearance industry. During that time we have employed only background checked professionals. We have further trained them to become the experts they are today. Our house clearance team in NW5 can dispose of any type or amount of rubbish. They can take on any challenge and deliver a remarkable service. From builders waste to garden junk, we can deal with it all. 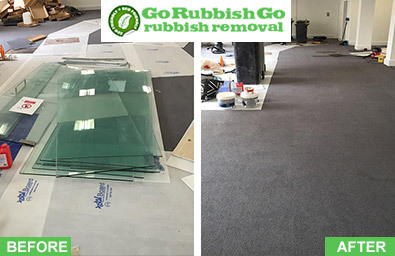 We complete all jobs with ease to make sure you will be one of the thousands of happy customers we have. Get in touch with us on 020 8610 9182 for a free consultation! Our house clearance in Dartmouth Park, NW5 are environmentally friendly. 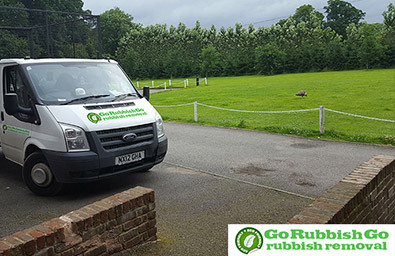 From the vehicles we use to the disposal methods we employ – everything is geared towards ensuring that you will get an eco-friendly service. We use recyclable bags and strive to recycle as much of your waste as we can. Up to 85% of all the waste we collect is repurposed in the local recycling centres. 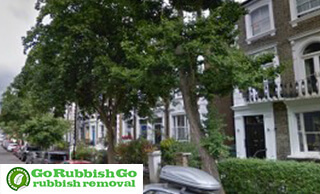 Go Rubbish Go is the go-to company when it comes to nature friendly house clearance NW5. Reserve your appointment today on 020 8610 9182! Book now and we help you do your bit for the environment! How much it costs to hire us for house clearance in Dartmouth Park? Call us and we will provide you with a free quote! The price of your job is based on the amount of rubbish you want to get rid of. We can deal with any kind of waste. From construction waste to e-waste, we can take care of it all. We can dispose of your heavy appliances, bulky furniture, general household rubbish, mattresses and garden clippings. We can respond to any last minute request. Call 020 8610 9182 now and hire our same day house clearance service NW5! You will get the best service at the best price in Dartmouth Park! If you are on a budget and want to clear out your home, come to us. We have a number of special offers and discounts to choose from. Why do all the back-breaking work when you can hire us to do it for you? You can have a house clear-out without doing all the hard work. Hire us and our Dartmouth Park house clearance NW5 team will clear out your property in a matter of hours. Hiring us won’t cost you an arm and a leg, just the opposite – you will save money and time with us! Book our NW5 house clearance Dartmouth Park today and you will get the best deal! Dartmouth Park is a residential district within the London Borough of Camden in north London. It is adjacent to Highgate, Kentish Town and Parliament Hill Fields. Most of the district consists of semi-detached and late-19th century terraced houses. The name of Dartmouth Park comes from the Earl of Dartmouth who owned the land in the 18th century. The area is home to St Mary Brookfield – a beautiful building that features red brick with contrasting blue and yellow brick patterns. Highgate Cemetery and Waterlow Park are located nearby. The area is well-served by public transport. Gospel Oak railway station, Archway tube station and Tufnell Park tube station are the nearest stations.